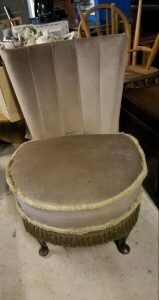 A vintage high back nursery chair on mahogany legs, upholstered in mauve velour with fringing detail. 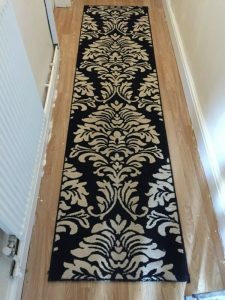 A large rectangular runner rug, decorated with a white damask pattern against a black ground. 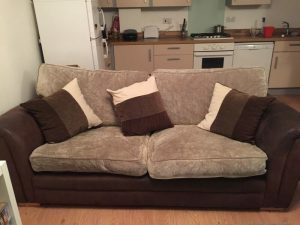 A two seater high back sofa on square legs, upholstered in chocolate brown faux leather and grey suede. 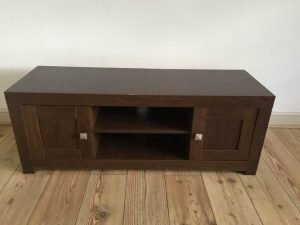 A solid oak large television unit, having a small cupboard to either side of a central shelf. 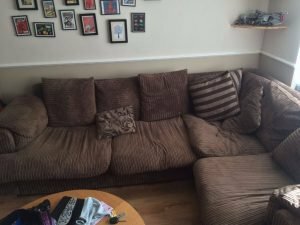 A four seater high back right hand corner sofa and cushions, upholstered in chocolate brown corded fabric. 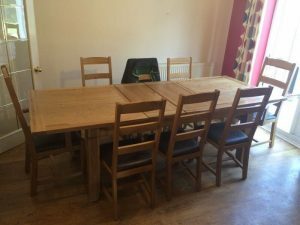 A large solid oak extendable rectangular dining table, together with eight matching high back dining chairs, upholstered to the seats in black faux leather. 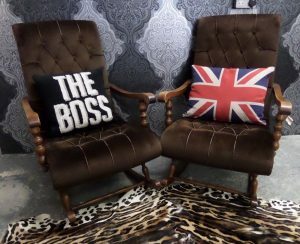 A pair of vintage high back solid mahogany rocking chairs, upholstered in chocolate brown velour. 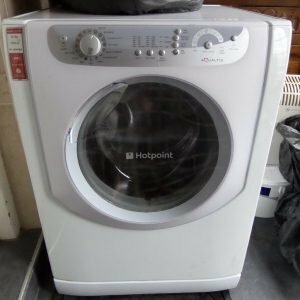 A white Hotpoint Aquatis 7.5kg 1200 spin under counter washing machine. 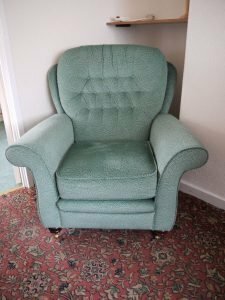 A vintage high back gentleman’s armchair on mahogany legs and bess castors, upholstered in green velour with button detail to the back. 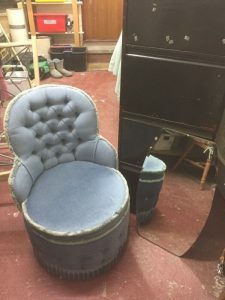 A small curved back circular vintage nursery chair, upholstered in blue velour with fringe and button details. 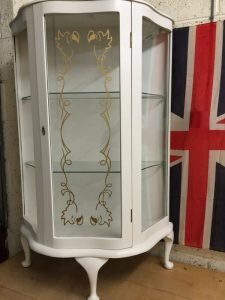 A white solid wood display cabinet on three legs, having a gold painted glass panelled door opening to reveal two glass shelves. A tall standing black wood floor lamp and circular black damask patterned shade. 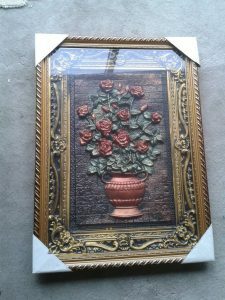 A brand new in packaging vintage style, heavily carved solid wood ornate 3D wall picture. 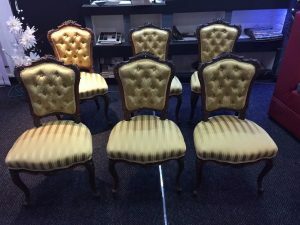 A set of six heavily carved solid wood vintage dining chairs, upholstered to the seats and backrests in gold fabric. 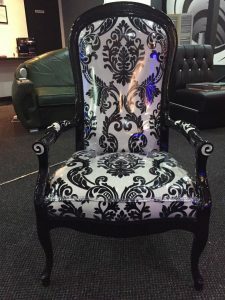 A black painted solid wood high back hall chair, upholstered in black and white damask patterned PVC. 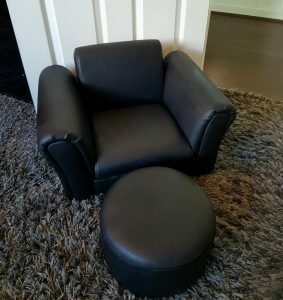 A small low back children’s square armchair and matching circular footstool, upholstered in black faux leather. 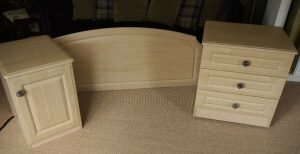 A three piece light oak bedroom furniture suite, to include a bedside chest of drawers, a bedside cabinet and a single headboard. 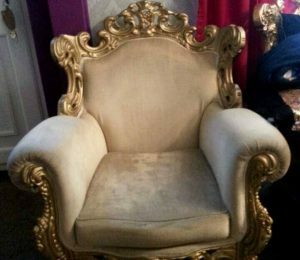 A hand painted gold heavily carved solid wood armchair, upholstered in cream velour. 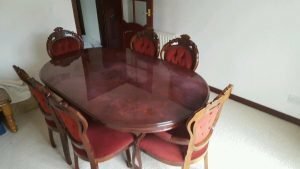 A solid mahogany oval vintage dining table, together with six matching high back dining chairs, upholstered to the seats and backrests in red velour. 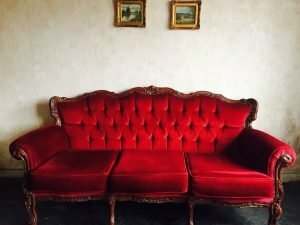 A three seater French vintage high back sofa on a heavily carved mahogany frame, upholstered in red velour.